Premium Quality Diamond Iridescent Beads on a Satiny Fabric Top - our acrylic is very different from the competition. Keep this in mind when placing your orders! We insist on beautiful bead quality, never using leftover materials so that when you hang our beads next to ANYONE else's, you will very clearly see the difference. We pay much more for our quality materials so that you'll never be embarrassed to hang our Beaded Curtains at your events or in your home. Please note that a few additional days are required for fabrication. These Rod Pocket Topped Beaded Curtains are perfect for use with Pipe and Drape systems or any type of curtain rod that you may already have. The opening on the top was made to accommodate both large and small diameter poles. 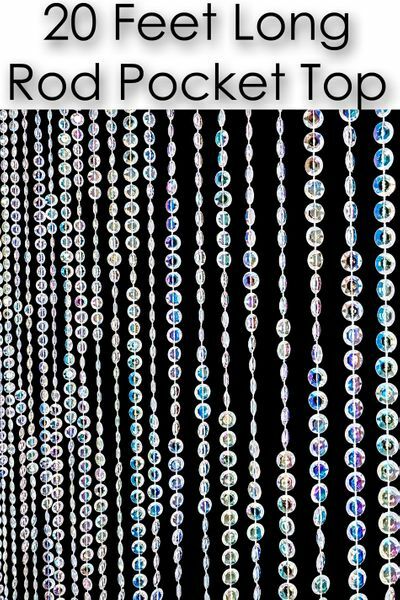 If you've been waiting for a flexible solution for hard to decorate spaces, you're gonna love our new 20 Foot Long Diamonds Crystal Iridescent Beaded Curtains with a Satin Rod Pocket! Classy, exquisite and now more versatile than ever, our Diamonds Crystal Beaded Curtains are known for their quality and for adding tons of sparkle as the faceted acrylic crystal beads capture and reflect light so we're very proud to add this new style which features a large, satin rod pocket! Now, you can enjoy the freedom to hang this glamorous curtain anywhere you want with the confidence that your event decor looks spectacular! 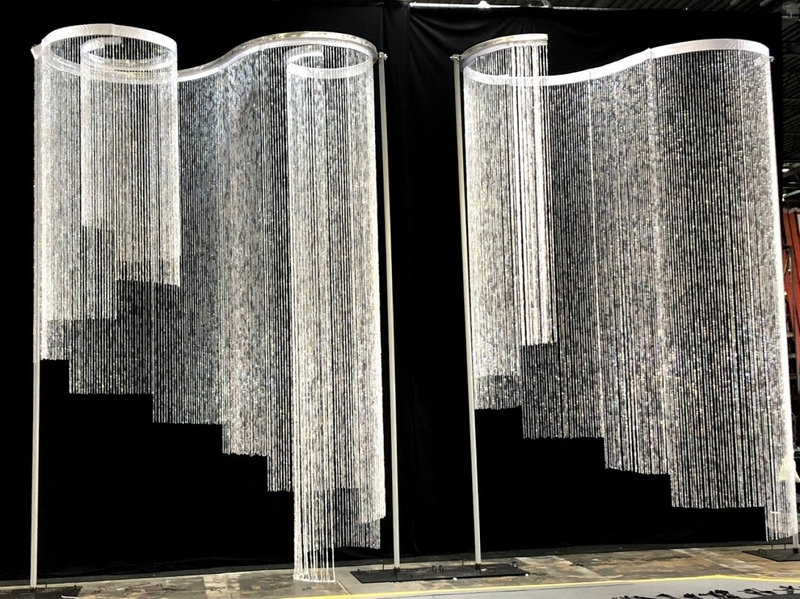 You can simply staple this curtain to a secure structure or using any type of rod and drapery hanging system, including wire, install this curtain just like any other panel and the added glimmer of the iridescent beads make this decorative curtain chic and swanky! 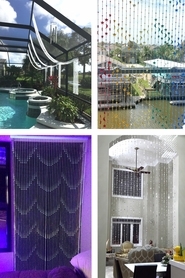 Each diamond-cut beaded curtain has 34 strands and each strand is 20' long. The rod pocket is 35 5/8" wide by 4" deep so the total length of this curtain is 20' 4"! The pocket is specially designed with 34 tiny tabs that are hidden from view and are used to hold the jump rings from which the bead strands hang. The beads are 7/16" wide (just shy of 1/2") and they have a pearlized coating which makes them absolutely gorgeous and even more so when light dances off them. Please watch the short video below to see how beautifully these crystals capture the light and produce a magical shimmery show! The sheen on the satin rod pocket goes perfectly with the beads and the pocket is lined which adds strength. All the edges are neatly finished, making this curtain event ready and wedding worthy! Add instant glam to weddings, special events, stage sets, outdoor celebrations, event tents, store windows, or use as a photo, video or head table backdrop! Add pizazz to a wall, window, doorway or use as a room divider. If your venue has a curved wall or you want to hang this around a corner, no problem! Use traditional curtain rods, curvy or wavy rods, tension spring rods, telescoping curtain rods, swing arm curtain rods, pipes, poles or wire! This flexible fabric pocket allows you to scrunch the curtain together to accommodate smaller areas or to create a fuller look. 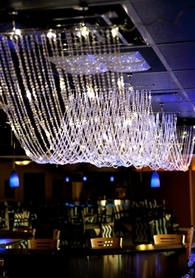 If you'd prefer a dazzling Crystal Column, no problem! Add as many curtains to the rod as you need for your taste and application. we're here to help make your vision a reality and we can help with hard to decorate areas! See how a stage set designer (and also a brilliant ShopWildThings customer!) 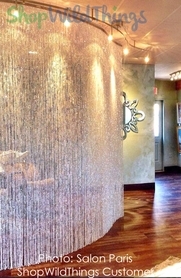 used beaded curtains to create an amazing chandelier! This versatile satin top diamond-beaded curtain weighs 7.1 lbs. and is also available in 6', 9' and 12'. If you need a shorter length, these diamond strands can be cut at any length you choose. The iridescent beads really catch the light and sparkle. Merchant Response:WOW! This is an amazing installation! Thank you for sharing your images with us!